Beaumont, TX — Earlier this month, DeMarcus Brown allegedly made the poor decision to shoplift an item from Walmart. Stealing the property of others is unacceptable, however, the punishment doled out by the cops who caught him was far worse than any petty theft. In an image posted to Facebook, Greg Brown, the father of DeMarcus saw the bloody aftermath of his beating. “The way that looked on that picture, I wouldn’t do that to an animal,” said Brown. Brown said police told him his son was shoplifting but later said his son failed to show identification and evaded arrest. According to Brown, and witnesses, police tasered him while he was on his knees and proceeded to dish out a horrid beating. “The people said he got down on his knees but they still tased him, beat him with a flash light, three knots on the top of his head, seven stitches in the top, and a fractured eye socket,” Brown said about his son’s injuries. Rightfully so, Brown is upset with what happened to his son. “He’s a good person. He’s not a murderer, a killer, anything like that,” said Brown. Brown says he hasn’t received any answers from the Beaumont police department as to why police did this to his son. According to KFDM, Chief Jim Singletary confirmed Internal Affairs is investigating and that all of the officers involved at the incident are still working. Brown said he wants others to come forward with any information if they saw what happened. As we previously reported, Beaumont police were caught on video breaking up a fight and then deliberately breaking the arm of a teenager. 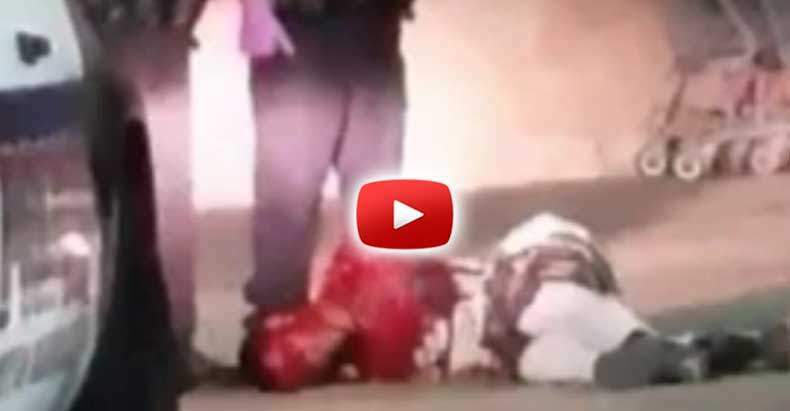 As the cop twisted the teen’s arm until it snapped, the teen can be heard screaming out in agony. The image of Brown’s limp body, laying in a pool of his own blood is hard to look at. It serves as a testament, however, as to the violent nature of the Beaumont police department.